Carolina Crown performs for a group of high school students. 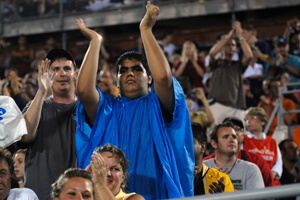 Despite hours of rain delays at the Florida Citrus Bowl, many fans stuck it out in wet weather to enjoy an alternate format for Drum Corps International's 2009 DCI Orlando Premier Event on Saturday. 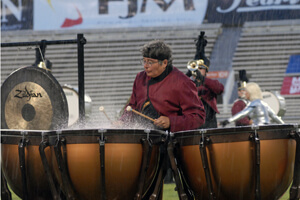 By the time the weather made a turn for the worse, the venerable stadium, which in past years has been host to the DCI World Championships, was already buzzing with activity. Carolina Crown hosted a Live Learning Event earlier in the afternoon. Part of a summer-long educational series, the event was offered free to ticket-holding students wishing to hone their marching, playing and spinning skills. Travis Kenley, an Orlando high school student who plays the tenor drums in his school's marching band, said that his favorite part of the Live Learning Event was watching Carolina Crown warm up. "I really like hearing them play clean. That's really impressive considering just how massive the corps is," said Kenley. before lightning caused a delay. Orlando high school clarinet player Yadi Sanchez said the event showed her what it takes to perform at the level of Marching Music's Major League. Yadi said she hopes to take what she learned and apply it within her own marching band. "Everything they do, we can take it back to our school," she said. By the time the Sun Devils took the field to kick off the event at 7 p.m., ominous clouds had filled the sky. The fans, however, cheered the Florida-based all-age corps on until DCI Contest Coordinator Tony DiCarlo was forced to put the competition on hold due to lightning. Initially, the contest was set to restart at 8:45 p.m., but another storm cell further delayed the corps' performances as heavy rain drenched the diehard drum corps fans that refused to leave without a show. 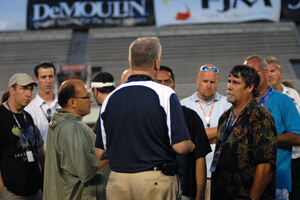 By the time the storms passed, all of the corps directors met with DiCarlo and DCI Executive Director Dan Acheson on the field to determine the best course of action. determine whether or not the show will go on. "Of course, safety is our utmost concern," said DiCarlo. "But our hope is that fans will always get some kind of show." Looking out for the safety of performers who would be forced to perform on a wet and muddy grass field, after the 50-yard line meeting, the corps directors decided to have their groups do standstill performances in lieu of their full programs. Despite the weather, fans were still treated to the powerful performances by the brass and percussion sections of the corps as they played selections from their 2009 programs, as well as music usually reserved for encore performances. Phantom Regiment played the fan-favorite, "Elsa's Procession" while Crossmen played the popular tune made famous by Neil Diamond, "Cherry Cherry." For many corps members from Florida, the DCI Orlando event was a "home show," with family and friends of corps members making up a large portion of the stadium audience. of these fans who stuck out the delays. Teal Sound tenor drummer Jake Siegel said it was a disappointment to be unable to perform the show to the fullest, but the opportunity to play a standstill was a good consolation. "All things considered, I think we did a good job," he said. 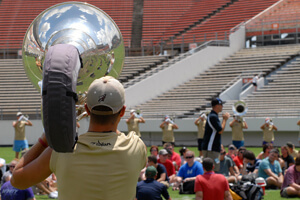 "The corps is from Jacksonville, so this was a home show for a lot of the members. Because of that we were really pumped up for it." The Boston Crusaders spend time during the winter in Florida for rehearsals and draw a lot of their membership from the state. Crusaders mellophone player Jenn Mammino is excited for the other big shows left on the corps' schedule this season, and said, "I'm completely disappointed about not marching today, but it's better to be safe." Corps will begin making their way this week down to the Lone Star State as the DCI Southwestern Series kicks off in Dallas and Houston on July 16, wrapping up Saturday, July 18 in San Antonio where all the World Class corps will meet up for the first time in one event at the Alamodome.